Home > Neil Shillington: Bookdealer & Booksearch > ATTABOY, SAM! Houghton Mifflin Books for Children. Good with no dust jacket. 1992. Hardcover. 0395615887 . Sam Krupnik; 0.61 x 8.6 x 5.8 Inches; 116 pages . 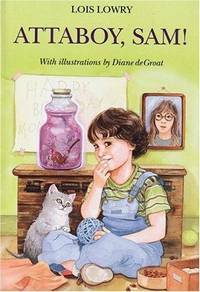 In this second book about Anastasia Krupnik's younger brother, Sam concocts a perfume made of his mother's favorite smells to honor her request for only homemade gifts for her birthday.